When Reza Shahidi graduated from the University of Maryland in 1994 with a Ph.D. in electrical engineering, there was little hint of the trajectory his career would quickly take. Shahidi had spent his academic years entirely at Maryland, earning a B.S. in 1985, and an M.S. in 1988 before receiving his Ph.D. with ISR-affiliated Professor Mark Shayman (ECE) as his advisor. At Maryland, Shahidi minored in communication and electrophysics, in addition to his major work in control. He took classes in information theory and digital signal processing as well. His M.S. thesis with Shayman and Professor P.S. Krishnaprasad (ECE/ISR) created algorithms for navigating mobile robots using potential functions. His dissertation, “Active Vibration Damping by Parametric Control,” explored controlling the stiffness of smart, flexible composite structures. After graduation, Shahidi didn’t work in control. He plunged into wireless communication, a field still in its infancy. In town to headline an ISR alumni seminar this fall, Shahidi reminisced about the early days of his career and its progression thus far. 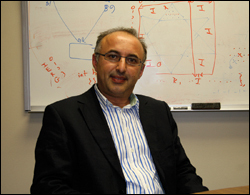 When Shahidi was in graduate school, professors like Tony Ephremides (ECE/ISR) were beginning to conduct nascent research in the area. But there were as yet few opportunities for engineering students to learn about the discipline at any university, anywhere. At that point only Virginia Tech had dipped its toe into cellular technology classes, Shahidi recalled. “So I got a lot of on-the-job training,” Shahidi said. “After I earned my Ph.D. I worked at the consulting firm LCC International in McLean as a technical instructor.” The subjects he learned about, then taught to others, were wireless protocols, wireless and cellular networks. Shahidi next became a design engineer with LCC. Working with Lucent, the LCC consultants helped develop Sprint’s CDMA network in Massachusetts, the first in the state. In 1997, Shahidi became a senior engineer at Qualcomm in its San Diego headquarters. He worked on systems engineering projects, CDMA and IS95 technology and was promoted to staff engineer. Qualcomm sold its infrastructure division to Ericsson in 1999, and Shahidi worked there for the next six years, holding positions including director of engineering. When Ericsson closed its San Diego offices in 2005, Shahidi returned to Qualcomm, where he is currently a principal engineering manager. Wherever his career has taken him, Shahidi has been grateful for his training in systems engineering.